Pick and roll: When a player picks the ball up off of the floor and then falls, rolls over, and gets back up. The picture below is Rock legend Jim Veltman performing a pick and roll to perfection (a top cheese play! 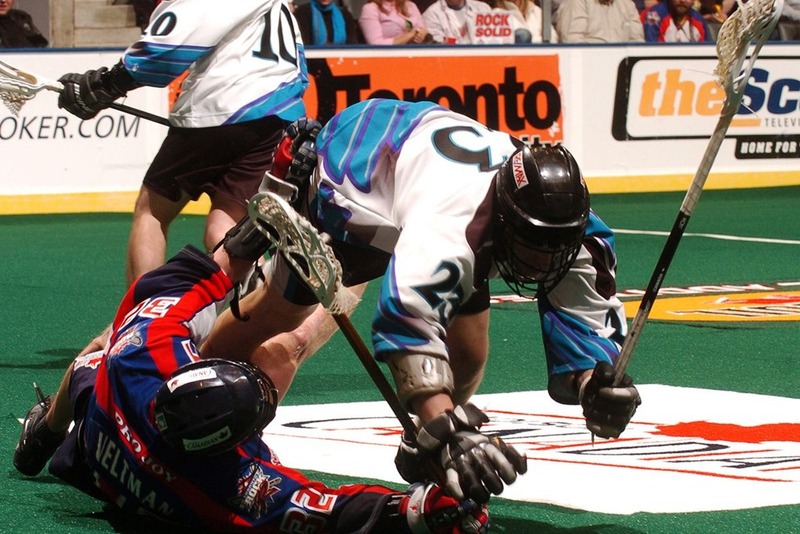 ), despite the Knighthawk defender trying to stop him. Pick and pop: Same as a pick and roll but the player jumps up faster. 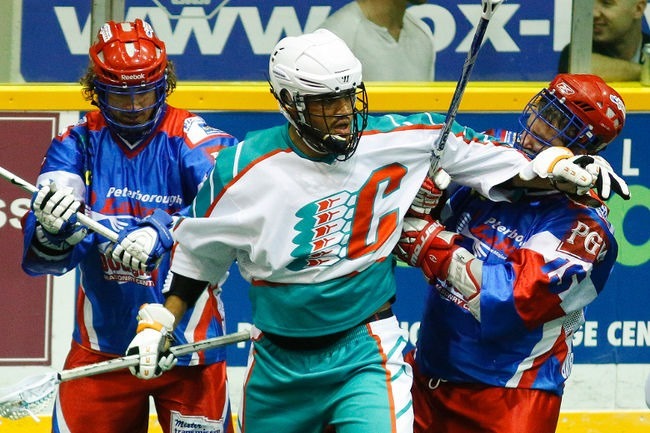 Inside shooter: A box lacrosse player. Outside shooter: A field lacrosse player. Give and go: Another word for transition. The goalie or a defender gives the ball to another player and he goes. Five hole: Your mouth. Some players, especially goaltenders for some reason, like to talk and yell a lot during games, so sometimes teammates tell them to shut their five hole. Swim move: To get through a big crowd of defenders, you put your arms out in front of you and push everyone to one side or the other, like a breast stroke. This allows your teammate behind you to have a clear shot at the net. This is also referred to as “clearing a lane”. See the picture below: Billy Dee Smith executing a swim move. Loosie: Loosening up before a game. “Picking up a loosie” is a way of saying that you’re doing some stretches. Some players like Brodie Merrill are always “picking up loosies”, so they are very flexible. Did April Fool’s come early this year?